PVC (Polyvinyl Chloride) a commonly acceptable commercial flat roof option is PVC roof system comes with a bundle of benefits that you will not regret, PVC is a trusted membrane that has been performing admirably for decades in the European market and in North America. PVC also offers excellent resistance to rooftop chemicals, including acids, oils and greases, extremely durable, best resistance to tears and punctures in your roof. The nature of the design is ideal with fewer seams to keep the water out better. Less seams means a reduced number of places that water could possible seep through. 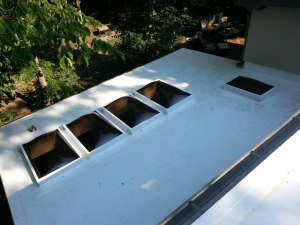 Fewer seams also make for easy installations with less required labor. Even if your roof ends up suffering from damage for some reason, repairs are easier than ever to carry out, as well as cost-effective. Maintenance-free for all intents and purposes, PVC roofing is a smart investment for your commercial flat roofing.